Artists and fans have been paying their respects to the legendary cartoonist Leo Baxendale. 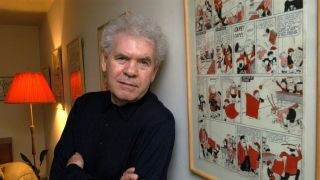 Comic illustrator Leo Baxendale, the mischievous hand behind the Bash Street Kids and Mini the Minx, has died at the age of 86. Baxendale's intricately detailed artwork and anarchic humour, found in the pages of The Beano, Wham!, Willy the Kid and many more, entertained generations of readers. His instantly recognisable and roguish art style created chaotic worlds where people walked on knobbly knees and clomped around in huge boots, and authority figures finally got their comeuppance. Despite leaving The Beano in 1962, the impact of his work can still be felt today as artists on the comic continue to emulate the look and feel of his characters. For plenty of readers, his cheeky ink drawings are the definitive Beano aesthetic. Born in Lancashire in 1930, Baxendale was originally unimpressed by The Beano when he came across the first edition, complete with disconcerting ostrich cover, in the playground. The comic became a diversion during the Second World War, and after a short period illustrating adverts and cartoons for the Lancashire Evening Post, Baxendale sent his portfolio to The Beano in 1953 after reading a Dennis the Menace strip. Baxendale's time on The Beano lead to the creation of comics such as Mini the Minx, The Bash Street Kids (originally published as When the Bell Rings), Little Plum, and The Three Bears. The hectic work schedule caught up with him though, and in 1962 Baxendale walked out. Two years later, Baxendale found work with Wham! and Smash! comics in London. His later career saw him creating the more adult-orientated Willy the Kid, and in the 1980s he took D.C. Thompson to court in a seven-year legal battle over the rights of his Beano creations. With the money from the settlement, he founded his own publishing house, Reaper Books. In 2013, Baxendale was inducted into the British Comic Awards Hall of Fame. He died of cancer last Tuesday, with the news being revealed two days later. Following the announcement, artists and comic fans have been paying their respects to the influential artist and writer. "Leo Baxendale’s work gave me and millions of other kids hours of fun and pleasure," says comic book artist and the co-creator of Watchmen, Dave Gibbons. "Packed with detail and incident, its anti-authoritarianism endeared it to its many readers. A wonderful writer and artist, Leo was a true original and a staunch champion of creators' rights." On the same site, Beano cartoonist Nigel Parkinson's tribute observed that "his self-taught tremendous energy and vitality made all his strips as hilarious as anything ever published. To this very (sad) day, he’s the only comic artist to have made me laugh out loud." Over on Facebook, comic archivist, author and publisher Paul Gravett wrote that "he did so much more than revolutionise British comics. He inspired in his readers, young and old, an anarchic, free-thinking spirit to challenge authority and be yourself." "Not many truly deserve the epithet 'legendary' but Leo Baxendale does," says Billy Bragg on Twitter. "A true genius of British comics. RIP." Baxendale's son Martin, a cartoonist in his own right, summed up his father's work on the BBC site. "The humour in Leo's work for children's comics and his later newspaper cartoons and books was always anarchic, anti the established order and pro fairness and justice in a generally unfair and unjust world, championing the underdog against the forces of oppression; a reflection of his strongly held left-wing, progressive political views," he explains. "In his comics' pages he saw the child characters he created as the underdogs long controlled and oppressed by the adult world around them and he gave them a voice and actions with which to fight back in hilariously anarchic fashion, allowed them to step into the limelight and control their own destinies. "Children of the time responded to that, writing fan letters of glee and appreciation that truly delighted him. The fan letters also came from grown-up children, reading his pages with as much enjoyment as their offspring."